The action-packed, month-long Archtober 2017, put on by New York City's Center for Architecture in collaboration with 70+ partners and sponsors, came to a close on October 31 with rave reviews and record attendance. This year’s festival had a stacked lineup of exciting events, tours, lectures, and competitions, including the ever popular, exclusive Building of the Day tours, the returning Great Architectural Bake-Off, and the crowd favorite, Pumpkitecture. In its seventh year, Archtober featured many fantastic partner exhibitions the reflected the festival’s international influence and drew crowds of architecture + design lovers. From discussing the norms of architecture in Sweden’s egalitarian society at Democratic Architecture by the Consulate General of Sweden and Van Alen Institute, to the exploration of one of the earliest encounters between Japan and the West at Hiroshi Sugimoto: Gates of Paradise put on by the Japan Society, these exhibitions encouraged a cross-cultural exchange of ideas between architects and designers in the US and beyond. Some of New York’s finest educational institutions hosted remarkable events that drew crowds of future architects and designers to interact with design professionals. At Parsons School of Constructed Environments, several informative lectures were held throughout the month; a highlight was “Housing: Left, Right, and Center”, an informative symposium that assessed the transformative potential in the architecture of urban housing. The New York School of Interior Design put on a “Faculty Exhibition” with a spectacular opening reception, while NYIT School of Architecture and Design held an “Advanced Design Workshop” open to students and designers alike led by famed Italian architect Franco Purini. The month began with a bang at the Building of the Day tour for the Woolworth Tower Residences and closed with the marvelous William Vale Hotel tour on October 31st. Other highlights included; the buildings and structures bringing academia and industry together at Cornell Tech; the sweeping views from Brooklyn Navy Yard’s intimate Brooklyn Grange rooftop farm; and the recently built, instantly-recognizable Tribeca condo tower, 56 Leonard Street, sold out nearly from day 1. The new Workshop Wednesdays were also a great hit, with three great firms, Studio Libeskind, SHoP Architects, and Rockwell Group, opening their office to the public for tours, talks, and events. 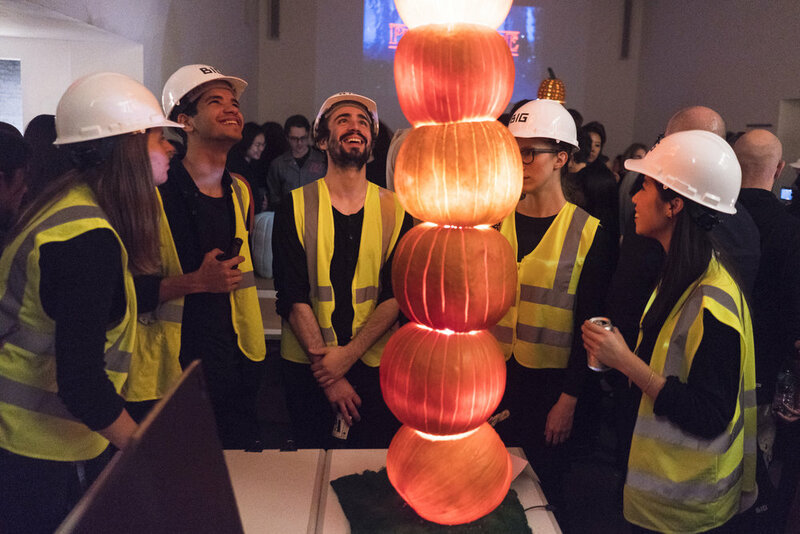 The Great Architectural Bake-Off, a competition for architects and designers to show their skills in a surprising new medium hosted by WATG, made a triumphant return this year with competitors like Woods Bagot, Hollwich Kushner, and Dattner Architects. This year's winner was the beautiful Smithsonian National Museum of African American History replica by Davis Brody Bond. Archtober Trivia Night followed shortly after, brought a heated battle of wits and architectural knowledge that drew design experts and history buffs alike. Pumpkitecture was a star event this year, with renowned firms like Bjarke Ingels Group, SO-IL, and WEISS/MANFREDI crafting dazzling pumpkin creations that stretched the limits of design. Ultimately, LOT-EK was crowned the winner for their appropriately-themed black and orange, geometric pumpkin, while many special nominations like “Most Self-Referential” (OMA New York) and “Most Politically Poignant” (Bernheimer Architecture) were handed out to the masterful creations of other participants.